Immigrants in Brooklyn and Queens came together last weekend to celebrate and share their gifts of faith, language and culture. Bishop Nicholas DiMarzio was the main celebrant of the diocesan Migration Day Mass at St. Joseph Co-Cathedral, Prospect Heights, Dec. 1. An estimated 258 million people currently live outside their home countries according to the UN’s International Migration Report 2017. Many are forced to leave their homes due to poverty; inadequate health care, food and jobs; or to flee conflict and persecution. The contributions of migrants – and the challenges they face – are recognized on a global scale on International Migrants Day, observed annually on Dec. 18. Reflecting on how migrants and immigrants are treated in today’s world, especially in the U.S., Bishop DiMarzio, a national leader in defense of migrants and past chairman of the U.S. Conference of Catholic Bishops’ Migration Committee, said, “We seem to be in different areas, different camps, different ways of thinking on things. The Diocese of Brooklyn and Queens is home to 28 ethnic ministries that serve people from around the world. The beauty of the various cultures was on display as attendees arrived at the co-cathedral, where the ceiling features images of various nations’ Madonnas. Members of each ethnic group carried banners in the entrance procession. Joining the celebration were Polish-born Auxiliary Bishop Witold Mroziewski, the new vicar for migrant and ethnic apostolates; Msgr. Ronald Marino, vicar emeritus; and Father Jason Espinal, associate vicar. Many priests who coordinate ethnic ministries in the diocese were also on the altar. Readings were proclaimed in Mandarin, Croatian and Spanish, and the Filipino Ministry Choir provided music for the celebration. 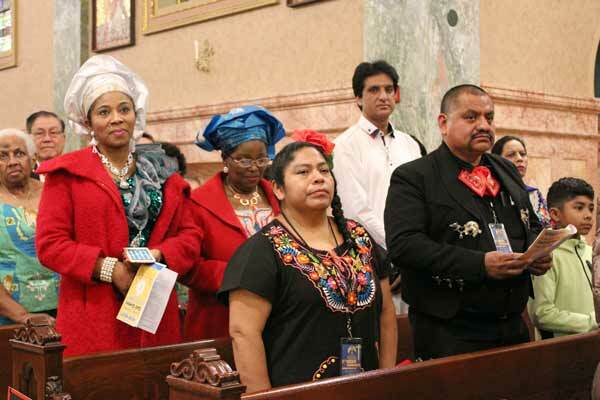 Men and women in their country’s native attire offered the Prayer of the Faithful in more than 20 languages, including Creole, Igbo, Vietnamese and Akan. Petitions were voiced for the Church, elected officials and the most vulnerable, including undocumented immigrants and asylum seekers. Prayers were also raised for those needing to be “touched with divine compassion,” so that they may see the world through God’s eyes. Father Patrick Keating, CEO of Catholic Migration Services, which works to empower and assist immigrant groups in the diocese, offered the homily at Mass. He likened the Brooklyn Diocese to the Brooklyn Bridge, which is comprised of many different steel wires that come together to give strength to the cables supporting the bridge. “When you and I come together, we are individual, singular pieces of steel wire, but when we’re interwoven – the new immigrants and the old immigrants, the young and the old, the Brooklyn and Queens – we have that strength,” he told the faithful. “And the Church is that bridge where we unite with one another, through Christ” to live and share the Good News, Father Keating said. 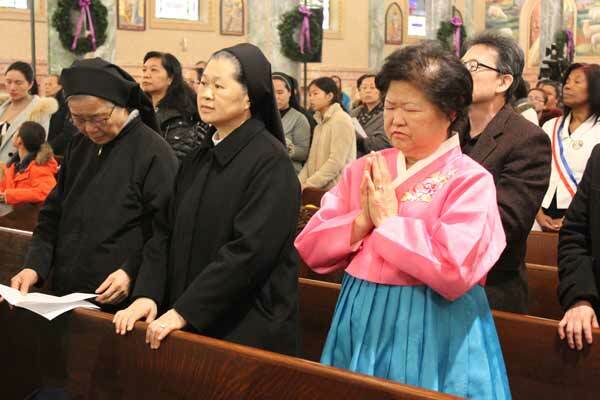 Wenmey Ting, a Chinese immigrant who attends St. John Vianney in Flushing, has been present at this annual event several times and this year, she came with younger members of her parish community. She wanted them to see and encounter people from all over the world who, like them, call this diocese their home. “We all come from different countries to become Americans, so this is a very meaningful Mass,” she said. In China, she explained, some people are “not lucky enough to be Catholic,” and don’t have the chance to know the one true God. Father Jorge Ortiz, coordinator of the ministry to Mexican immigrants, was happy to see members of his ministry mingling with their brothers and sisters from China, Korea and Ghana. “We all are one humankind,” said Gladys Ozoude, a Nigerian immigrant who resides in Incarnation parish, Queens Village. “We’re all visitors on earth. One of these days, we all go back to where we came from so we should welcome each other,” she said. 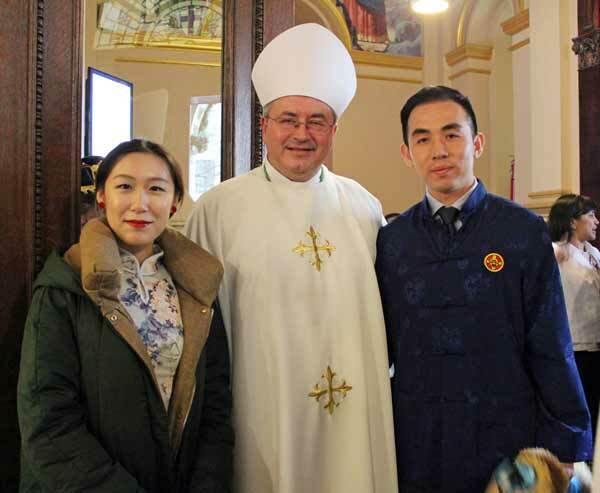 Polish-born Auxiliary Bishop Witold Mroziewski, the new vicar for migrant and ethnic apostolates, shares a moment at the annual Migration day Mass with Chinese parishioner of St. John Vianney Church, Flushing.